I decided to post this on Christmas day – I’m not writing it today, as I’m (hopefully) spending the day with family. I wrote this a week or so before Christmas, but today feels like a great time to share it. Today I am grateful. For the people and the things I have in my life, of course. But I am even more grateful because I have a new appreciation of the things that I had taken for granted. With my own legs and no crutches. I am grateful for what has happened to me in the last 3+ months since I broke my leg at the beginning of September. I am grateful to the NHS for the prompt intervention of the paramedics – I am grateful to those 2 ladies for going out of their way for keeping me comfortable. And I hope they are having a good Christmas and get the spend a couple of minutes thinking about all the people they help on a daily basis, and how much of a difference they make. I am grateful to my husband for his patience, support, and help, especially in the last few months, although patience, support and help are always there, and they are not to be taken for granted. And I am grateful to my mum, for the 3 round trips and the 6 weeks that she took out of her own life to be here with us, and to do for us what I couldn’t do. I couldn’t have done it without her. To my brothers-in-law and sister-in-law for all the practical help, they gave me during these months. And to my father-in-law for his love, his prayers, and encouragement. I am grateful to the friends and family who have supported me, encouraged me, thought about me, and brought me food when I couldn’t even stand! To those who have come to cook me food or offered to help in any way they could. I am grateful to my big boy’s friends’ mums, who helped to get him where he needed to be after school, week after week. I am grateful to my 3 boys, who, in their own ways, adapted brilliantly to the situation. Mamma might have been using crutches and not been able to drive them anywhere, to take them to school or, for weeks, do much for them at all. But Mamma was there, and they worked around it. And they didn’t moan. I am grateful for the care I have received and for the surgery that allowed me to be back on my feet within weeks from my fall, even though I had to learn to do it all with crutches. I am SO grateful that this surgery was even possible, as 6 months with an above-the-knee plaster cast would have been a whole different story. And I am grateful because the surgery went well, my fracture could be fixed, my body is playing ball, and my leg is healing nicely. Today, I am SO grateful because I can walk. I can finally walk again. But I don’t write these months off. Not at all. I am grateful for the time I was given to stay at home and rest. I am grateful for the break from the crazy busy life I was leading, rushing from pillar to post with a sense of never being on top of things. It wasn’t healthy. And although I had recognised it, I might not have done enough to really stop it. I am grateful for the time spent at home with my boys, for the things I learnt, for my blog, and for the support I have received from the ‘virtual’ world through it. It’s Christmas day, and I’ve never felt so grateful before. So today I want to bottle this feeling up, and take a sip from it whenever I like or need to, because today I am really really grateful, and I feel extremely happy about it. 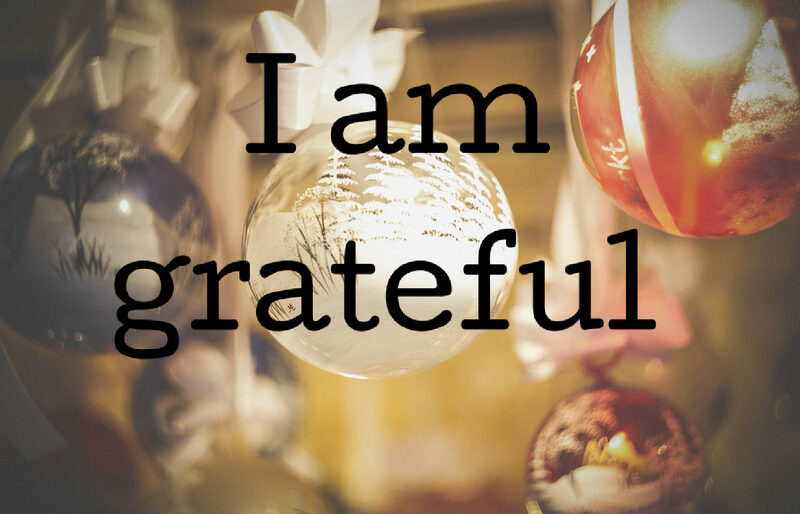 Is there anything, in particular, you are grateful for this Christmas?